Romaine hearts — the light green inner leaves sold in bags in the produce section of grocery stores — become smoky and almost meaty when they are grilled. 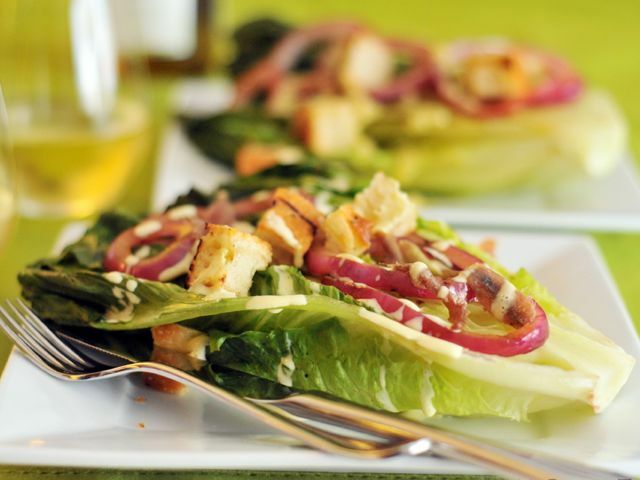 In this substantial salad, I pair them with grilled marinated onions, focaccia croutons, and creamy homemade Caesar dressing. The recipe is essentially vegetarian, but if you love anchovies, you won't be disappointed. Anchovies are draped over the omnivores' salads and a little of the oil the fishies are packed in is used to brush the lettuce before it hits the grill, too. If you're not a fan of anchovies, omit them from the recipe and use olive oil instead, as with the vegetarian portion. While the grill is preheating, combine the egg yolk, garlic, Worcestershire sauce, mustard, and lemon juice in a blender. With the machine running, gradually add the oil in a slow, steady stream. Transfer the dressing to a small bowl, season with the salt and pepper, and set aside. Brush the onion slices with 1 tablespoon of the oil. Grill the onions until just tender, about 3 minutes per side; place them in a small bowl, sprinkle with the vinegar, and set aside. Grill the focaccia until lightly charred and crisp, 3 minutes per side. Cut into 1-inch cubes and set aside. For vegetarians, brush 1 romaine half with the remaining 2 teaspoons of oil. Brush the remaining romaine halves with the reserved anchovy oil. Grill all the romaine halves, keeping the vegetarian portion separate, until they are slightly wilted and charred, about 3 minutes per side. For vegetarians, place the vegetarian romaine half on a dinner plate and set to one side. Divide the remaining grilled heads among 3 dinner plates. Sprinkle all the salads with the onions, focaccia croutons, and cheese. Drizzle each with a few tablespoons of the dressing. Top the omnivores' salads with anchovies. Serve immediately with a fork and steak knife. Most brands of Worcestershire sauce contain anchovies. Look for vegetarian or vegan Worcestershire sauce, like Wizard's, at natural-food stores. Vegan variation: Roast 1 head of garlic, wrapped in tinfoil, in a 350-degree oven until it is soft when squeezed, about 45 minutes to 1 hour. When it is cool enough to handle, squeeze the garlic out of its papery skin and mash with a fork. Whisk with 1 tablespoon lemon juice, 1 teaspoon Dijon mustard, and 3 tablespoons extra-virgin olive oil. Season with salt and pepper and use it in place of the egg-based dressing. Omit the cheese topping.